[Private Listing] Havelok Hill - 600 acres and spectacular views! 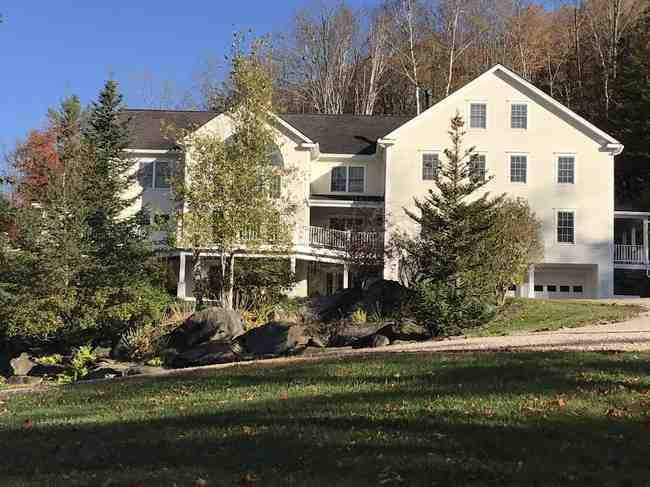 For more information, high resolution photos and other information, please visit the website dedicated to this property by clicking here: HAVELOK HILL WEBSITE "HAVELOK HILL" is privately situated in the midst of +/- 600 acres in lovely Strafford, Vermont. The land component is the most extraordinary parcel our firm has ever offered for sale, including absolutely stunning long range mountain views from the main residence that includes the White Mountains of New Hampshire to the east, and to the west, the Green Mountains of Vermont including direct views (from the patio area) of Mt. Ascutney, Okemo, Killington, Pico, Camels Hump and Mt. Mansfield (Stowe) among others. The property has five secluded ponds, approximately 200 acres of upland meadows, and eight miles of improved interior roads and riding trails for every conceivable type of outdoor activity - all on your own private compound. The main residence is situated at the height of land, perfectly oriented towards the views. The present owners spared no expense in designing a residence of the highest quality and taste, centered around a magnificent 1,500 square foot (30 x 50) wood-paneled great room ("the concert hall") with a 24-foot vaulted ceilings, 8-foot custom-built mahogany french doors to the patio/view, and a massive fieldstone fireplace. The property also includes a four-bedroom guest or caretaker's cottage - nearby but out of view of the main residence. Located nearly equidistant between Woodstock, Vermont and Hanover, New Hampshire, Havelok Hill offers incredible privacy and quietude, with access to the best the Woodstock-Hanover area has to offer. SUNNYSIDE is one of the most perfectly designed and constructed brick Georgian Revival residences in New England - located on a prestigious South Woodstock hilltop on 82.5 acres, with beautiful panoramic views of the surrounding hills and offering absolute privacy. Construction was completed in 2002, with unparalleled attention to detail. And the property has been meticulously manicured and maintained. 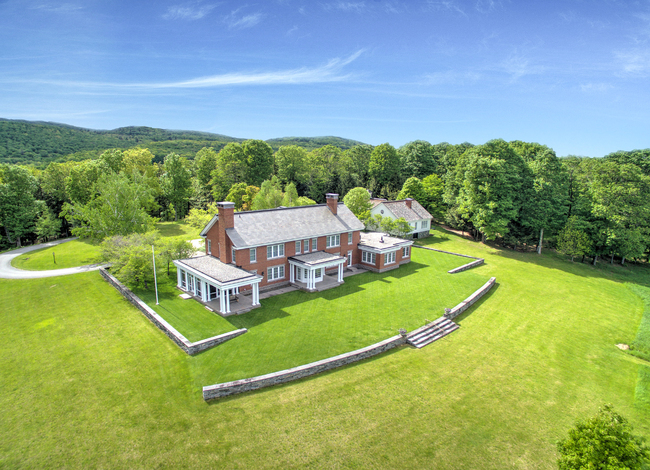 The 7,000 square foot main residence combines a formal elegance with a beautiful Vermont hilltop setting. The residence features four fireplaces, expansive living and dining rooms, a butternut paneled library, den, continuous flow swimming pool, three-story elevator and a large, beautifully appointed gourmet kitchen with adjoining pantry. The master bedroom with fireplace features two dressing rooms and two bathrooms. Three other guest bedrooms are elegantly appointed with en suite baths. Nearby is a guest house with it's own dining and living rooms, and two bedrooms. The property also includes a walk-in 3-bay garage attached to the main residence, and a nearby 4-bay detached garage for your other motorized toys. The pastoral setting, woodlands with over one mile of carriage-width trails, and beautifully landscaped and manicured land component affords this property a distinctive pedigree. Located near the Village of Woodstock in an area of other substantial properties. Sunnyside was listed and sold by John Snyder of Snyder Donegan Real Estate Group. One of the best investments on the market today. Chester Forest consists of 1,803.79 acres of well-stocked and managed forest with over $2.6 million of standing timber, dominated by Sugar Maple. On the property is an easily accessible 650 square foot log home built in 1991 from logs harvested from the land and set in an apple orchard field with tremendous views to the southwest. John Snyder of Snyder Donegan Real Estate Group represented the Buyer in the purchase of this beautifully renovated historic residence on approx. 173 acres in Woodstock, then the purchase of an additional 50 acres of abutting land. Exceptionally finished, custom-built residence situated on 42.15 acres with antique wide plank flooring, large historic barn, pastures, and swimming pond in prime South Woodstock location, close to the Village of Woodstock. New construction was completed in 2011 by architect/builder Hank Savelberg. Spacious foyer-entry opens to great room with 14 foot ceilings, large dramatic fireplace and windows and fine woodwork. Main level master bedroom with fireplace and ensuite bath. Kitchen with bar/pantry opens to dining room, as well as large screened in porch and deck with views of the pasture and pond. High ceilings and beautiful craftsmanship throughout. Heated 2-car attached garage with dog shower opens to elegant mudroom near large laundry room. Two private offices on first level. Downstairs has two guest bedrooms, both with en suite baths, and one connects to a baby room. Downstairs den/TV room is with bar sink and fridge. Exterior is well landscaped with substantial stone work. Large barn with summer-finished addition for an office, parties or entertaining guests. Charming corn crib remade into quaint gardening shed. The best of an historic Vermont farm property with a wonderful newer construction custom-built residence. Exclusively listed by John Snyder of Snyder Donegan Real Estate Group. PEACE MOUNTAIN: 183 ACRES, TOTAL PRIVACY and STUNNING VIEWS! 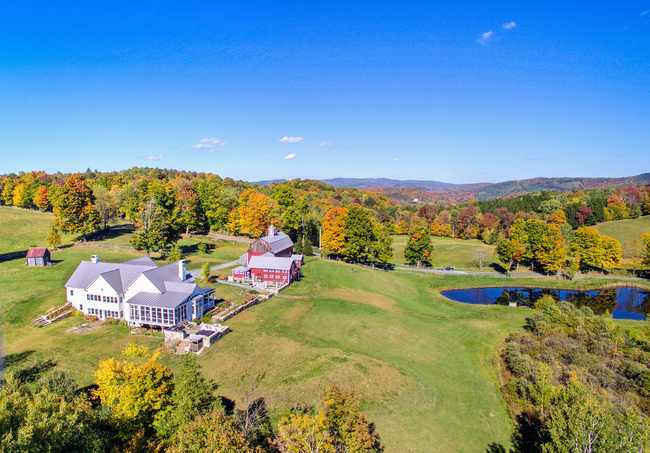 For a more and better photos and information on Peace Mountain Way, please visit the dedicated website for this property by clicking here: PEACE MOUNTAIN WEBSITE "PEACE MOUNTAIN" is a private estate with breathtaking views of the Ottauquechee River Valley. 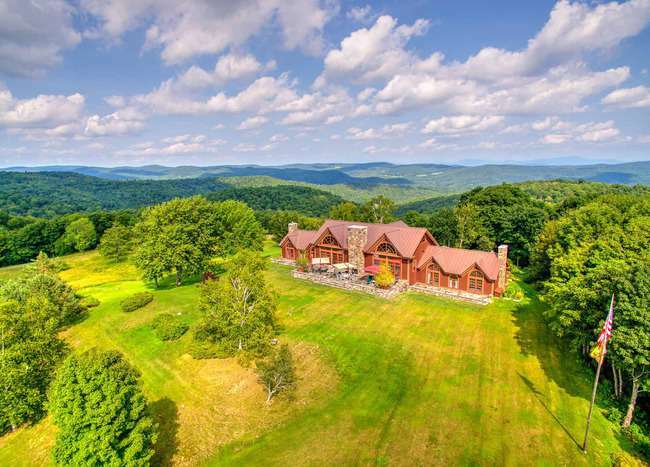 Custom built in 2008, Peace Mountain is a spectacular Arts & Crafts shingle style home situated on 183 acres with a vaulted ceiling yoga/recreation room and scenic trails for hiking, snowmobiling, mountain biking and cross country skiing for year round recreation. It is designed for gracious living and offers total peace and tranquility. Spacious gathering rooms open out to a wide veranda surrounding three sides of the home with a beautiful stone fireplace and grilling area for 3 season use. The property includes five river stone fireplaces as well as a wood-fired pizza oven in the kitchen to enjoy in winter evenings. Peace Mountain was designed for an active family and extended family and includes a climate controlled hardwood yoga studio/basketball court, rock climbing wall with spectacular views and an expansive storage area for outdoor recreation equipment. Convenient to the Killington Ski area, Dartmouth College and is located four miles from the Woodstock Village. Off private road leading to the house is direct access to VAST snowmobile trails to east and west. Multiple building sites served by underground utilities. Located at the end of a paved private road engineered for New England's rugged weather. The Peace Mountain Ranch is an exceptional property and is ideal for a residence, yoga retreat, corporate retreat, or family gathering compound. For a more and better photos and information on Twin Ponds, please visit the dedicated website for this property by clicking here: TWIN PONDS WEBSITE The land component of Twin Ponds is a private and pastoral setting on 52.2 acres with two ponds, open high meadows with lovely views of distant hills, two streams with waterfalls that course through the property (and by the main house and guest house) and a new post-and-beam barn with horse stalls, chicken coop and room for tractors and other motorized toys. The main residence has a post & beam great room with 25-foot stone fireplace and views, beautiful eat-in gourmet kitchen, large master bedroom suite, large downstairs game/rec/office space and bedrooms to sleep 15+. The “Gristmill” guest house is nearby complete with open living/dining/kitchen, full bath and bedroom - and has a separate water source from a gushing Vermont spring. The land is in Vermont Current Use conservation program, comprised of woodlands, open meadows, stone walls, apple trees, wildlife pond and separate swimming pond. Appalachian trail is nearby. First rate mechanicals include full back-up generator, six bedroom septic, full security system and more. This property has a Woodstock postal address and phone number and is 9 minutes to the town green in Woodstock Village, but is a legal parcel of the town of Barnard. Easy access to ski resorts and Hanover/Dartmouth. 52 Acres of Pastoral Vermont with 2 ponds, 2 streams, high meadow views, barn, guest house, more! For a more and better photos and information on Twin Ponds, please visit the dedicated website for this property by clicking here: TWIN PONDS WEBSITE "TWIN PONDS" - The land component of Twin Ponds is a private and pastoral setting on 52.2 acres with two ponds, open high meadows with lovely views of distant hills, two streams with waterfalls that course through the property (and by the main house and guest house) and a new post-and-beam barn with horse stalls, chicken coop and room for tractors and other motorized toys. The main residence has a post & beam great room with 25-foot stone fireplace and views, beautiful eat-in gourmet kitchen, large master bedroom suite, large downstairs game/rec/office space and bedrooms to sleep 15+. The Gristmill guest house is nearby complete with open living/dining/kitchen, full bath and bedroom, and has a separate water source from a gushing Vermont spring. The land is in Vermont Current Use conservation program, comprised of woodlands, open meadows, stone walls, apple trees, wildlife pond and separate swimming pond. Appalachian trail is nearby. First rate mechanicals include full back-up generator, 6 bedroom septic, full security system and more. This property has a Woodstock postal address and phone number and is 9 minutes to the town green in Woodstock Village, but is a legal parcel of the town of Barnard. Easy access to ski resorts and Hanover/Dartmouth. For more and better photos and information on Hubbard Farm, please visit the dedicated website for this property by clicking here: HUBBARD FARM WEBSITE "HUBBARD FARM - Fully renovated, classic, historic hilltop farm property on +/- 130 acres with long-range mountain views of Killington, a swimming pond, tennis court, open meadows and a 3-mile private trail network - much of which is enrolled in the Vermont Current Use Program. The recently and beautifully fully renovated residence has hip, contemporary styling, a large gourmet kitchen, two den/family rooms, a private dining room, expansive wrap around porch oriented to take in the view, downstairs recreation room, 5 fireplaces, radiant heat throughout, MBR with bath and steam shower, and other fully renovated bedrooms and baths. Russound speaker sound system throughout the 1st floor and porch. Large breezeway leads to the huge historic post-and-beam barn that presently serves as a garage. Located approximately 7 minutes from the village green in Woodstock, Vermont - with end of road privacy - this property has access only from Woodstock, a South Woodstock mailing address and emergency services, but is legally located in the town of Hartland. Truly a special property and residence with all the features most desirable in a Vermont getaway, relocation or retirement home. See more at www.grahallvermont.com GRAHALL- A feat of architecture and engineering, this is a spectacular, one of kind estate on 240+ acres in prime central Vermont. Drawing inspiration from an iconic castle on a loch, Grahall sits atop Hawk's Mountain with breathtaking views in all directions. The home was built with stunning Glimmerstone Granite that is indigenous to the area and quarried directly from the property. An incredible amount of thought and planning went into the creation of the exteriors and interiors. While the structure is commanding the interiors feel warm and embracing. Many of the gathering rooms are circular with large granite fireplaces. There is wonderful light throughout the house providing passive solar. There are 7 well appointed bedrooms and 5 baths. The 270 degree view takes in neighboring ski mountains like Okemo, and the grounds are accented by two stocked ponds that reflect the house like a moat. Grahall has a very successful track record as a corporate retreat and rental property.